Program Description: The Master of Arts: Theological Studies (MATS) is for persons who wish a graduate degree in theological studies, as a supplement to their professional training and/or for strengthening their participation in the life, mission and service of the church.The goal of the M.Div. program is the education and formation of Christian men and women for pastoral and other leadership ministries. It focuses on service in a variety of church settings. The program is designed to develop spiritually mature, Holy Spirit-led pastors to care for and guide the church. Five concentrations with modified plans of study are available: pastoral ministry, pastoral care and counseling, mission and evangelism, youth ministry, and theological studies. 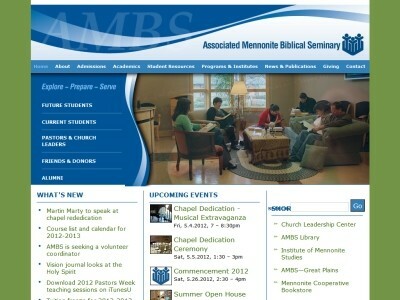 Location & access map for "Associated Mennonite Biblical Seminary"